In addition, many of my customers also ask about windows with titles enclosed by periods, i.e., ".Customer Maintenance. ", or preceded by one period, i.e., ".Customer Maintenance", or suffixed by one period, i.e., "Customer Maintenance. ", of course, for the trained and qualified eye, all created with Modifier and/or VBA, and/or both. The question is often, why is it that we have these two periods around the window name? Can't we change it to something more visually appealing and truly indicative of existing customizations?The honest truth is, unless you have a much trained eye, these periods can escape you very easily and can make users very confused as to what they are seeing on the screen. 1) If the window includes only changes done with Modifier -- one period at the beginning of the window title -- change the title to MOD: Window Name. NOTE: the period cannot be removed under Modifier, hence once security is granted; the window title will appear as .MOD: Window Name. The period is not completely gone, but still the impact of having the word "MOD" in the title is already a big change from just the period. 3) If the window includes changes done with Modifier and Visual Basic for Applications, change the title to MVBA: Window Name. 1) Open Modifier and perform all necessary changes to your window. 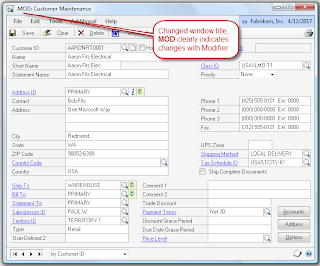 Before save, change the Object Title property to MOD: Customer Maintenance as shown below. 3) Grant security to the modified window. 4) Open the window to view the title. As shown below, it is easier to identify changes done with Modifier this way. 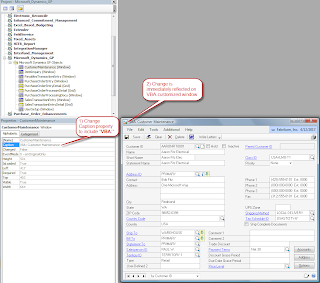 3) Change the Caption property as shown below to reflect VBA: Customer Maintenance. 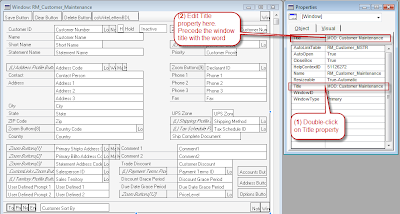 4) When window is displayed by GP, title is now preceded by the word VBA. Trivial? Maybe. However, these simple techniques for identifying customizations done with Modifier and further enhanced with VBA, have saved me from many redundant and sometimes unnecessary questions and comments, including "some developer did not pay attention when they were typing the window title", ehem!